Luna Luna is an online magazine “divided into two very generalized sections: dark and light. It is not a perfect binary; much of what we explore falls in between. For us, the light is where we talk art and opinion, growth and creativity. The dark may be those things we tend to keep quiet – more internal, maybe a bit dangerous, maybe at odds with social norms, maybe indulgent. Or maybe they’re just not in the light. We believe both are necessary. We believe it is healthy to have a balance.” To read more about Luna Luna and their editors, read their About page here. 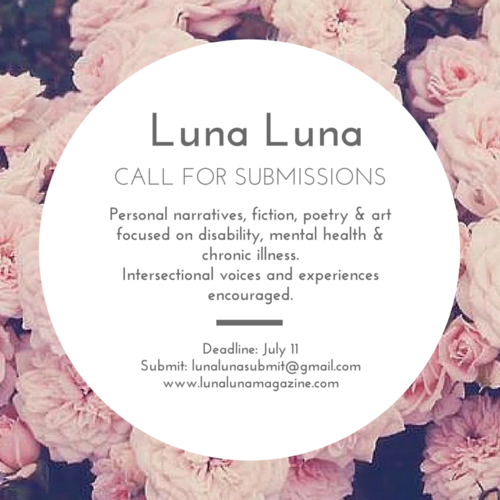 Regular submissions are always open and currently they have calls open for two upcoming special issues: the first is focused on disability, mental health, and chronic illness; the second is focused on work inspired by vintage beauty and lifestyle. FORMS: Poetry, prose, articles, interviews, etc. See their general guidelines for more info. Where to submit formal verse (rhyming, blank verse, villanelle, sonnet, etc.) – 6 new listings! Wonderful. Thanks so much for posting.